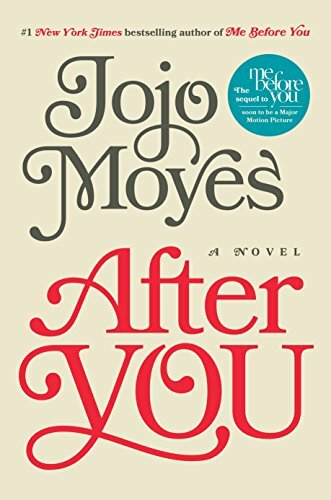 With this sentence in After You, Jojo Moyes turns the successful prequel to this novel on its ear. It’s a brave move in a market saturated with “feel-good” novels, but it feels more authentic than the lot of them. In Me Before You, Moyes introduced Louisa, a plucky late-twentysomething. Hired to care for a handicapped man, Lou is stunned to find out that he desires to die. The novel was wildly popular and provoked international discussion on the right to die. Moyes did a sterling job of presenting both sides of the issue without prejudice toward one or the other, and the end of the book saw a Lou who has made a sort of peace with both herself and life, hopeful for a brighter future. After You showcases a different Louisa. She is a woman in free-fall. Eighteen months after the events of Me Before You, she is finding it difficult to live up to the promises she made to Will, her handicapped charge in Me Before You. She traveled, but didn’t enjoy it. She moved out of their small town, but still hasn’t bothered to furnish her London flat past the bare essentials. She hasn’t made it back to school and works a joyless, dead end job. Eventually she has her own life-changing accident. The cast of characters of After You is introduced at this point: her family, members of her grief support group, a handsome paramedic, and a surprise member of Will’s past. Moyes does a neat job with Lou’s character development in After You. Though “plucky” was a good description in the previous book, this is a more adult Louisa. Suffering has made her both more thoughtful and more cynical than she was in Me Before You. Though she still has her trademark sense of humor, she is more often left questioning her future than laughing. “Sometimes I felt as if we were all wading around in grief, reluctant to admit to others how far we were waving or drowning,” Lou reflects, in one example of Moyes’ thoughtful prose. Despite her grief, though, Lou finds humor in her mother’s feminist awakening and the tales of the fellow survivors in her grief-counseling group. Louisa’s family was introduced in the first book, but Moyes takes the time in this book to present them as people who have changed over time. Though some of the situations surrounding her parents’ marital struggles seem contrived, Moyes imbues them with a healthy humanity that allows the characters to rise above the contrivance. It is in Lou’s return to the land of dating that Moyes’ narrative really shines. Her character’s fear, desire, and hope at long last are perfectly showcased in her reaction to an imminent sexual situation: “I watched his hands. I watched his hands.” As a flashback to her time with Will, who could move his hands only intermittently and with great effort, it is a bittersweet moment for a reader who has followed both books. Sam, handsome paramedic and owner of the aforementioned hands, is a fitting foil for Louisa. He is struggling with his own grief over the loss of his sister, but rather than wallow he has enough hope and faith for both of them. “There’s only one response, and I can tell you this because I see it every day. You live. And you throw yourself into everything and try not to think about the bruises,” he rages at Louisa at one point, and the reader cannot help but cheer for him. He isn’t a perfect character, as is the temptation to make a love interest, but a measured look at a man doing his best. The weakest point of the book involves a needlessly complex backstory for the mysterious person from Will’s past. A melodramatic personal story followed by an absolutely unbelievable denouement seems shoehorned into what is an otherwise believable story. Louisa’s relationship with her grief-counseling group is problematic as well. They are one-dimensional characters for the most part, and Louisa’s interchanges with them are truncated. When, at the end of the story, she refers to them as her friends, it is a bit of a surprise. It reads as if Moyes originally had more with the grief-counseling group and cut it in favor of adding theatrics with the person from Will’s past. “This is what catastrophe does: it strips away the fluff and the white noise, the should I really and the but what if . . . ?” Louisa’s discovery of this truism is at the heart of After You. A couple of hitches in the story aren’t enough to completely derail this lovely book. After You is a strong story of life after loss, and the end is ultimately far more satisfying than the high-flying optimism that concluded its predecessor.